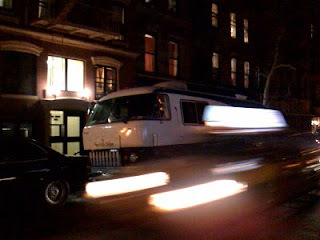 Leaving Umi No Ie in the East Village, I saw this fantastic looking camper van across the street and took this little pic with my iPhone. 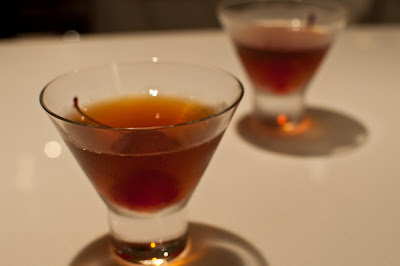 Back in the Fall of 2009, I researched an article on Manhattans. After walking around (trying to get a mild form of exercise) in the chilly city yesterday afternoon, a comforting Manhattan felt like the right answer. As I was walking away from the kitchen counter with my cocktail, I thought about the Log Cabin (bacon-infused bourbon and maple syrup) at Northeast Kingdom and realized that while I have made bacon-infused bourbon yet, I did have some bourbon barrel aged syrup on hand. I added maybe a teaspoon to the cocktail for a touch of sweetness. I didn't stir up the cocktail again, just let it rest at the bottom. It was a delightful evolution through the cocktail to end up with a maple Manhattan at the end. 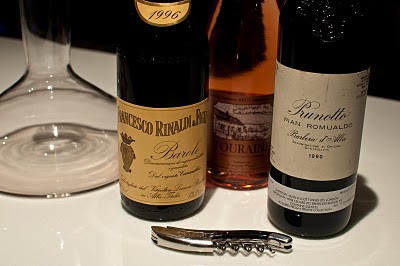 Like getting a perfect little dessert at the end of your meal. And while it may not be a touch I add to my Manhattan every time, it is definitely making it into the repertoire. 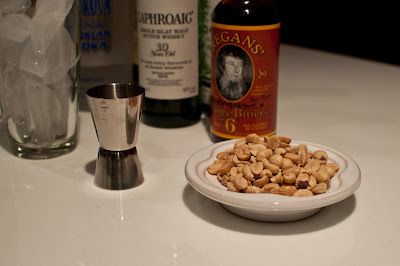 I was reviewing my blog history yesterday and remembered the Northern Light Cocktail. I recreated this cocktail a year ago after returning from London. I wouldn't classify it as a cold winter's night cocktail, but then again, it's not exactly a summer cocktail. The Laphroaig adds such a lovely smokey component. Either way, it's a damn fine cocktail. - Stir with a cocktail spoon. - Rinse 10 Year Old Laphroaig in the cocktail glass and drain (or not). 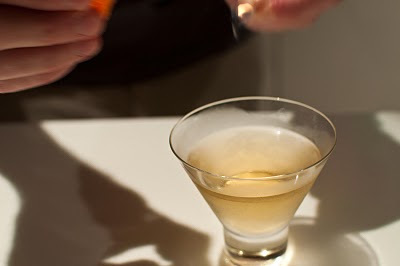 - Strain the cocktail into the martini glass and flame with an orange twist. If made correctly, everything should be perfectly in balance. A quick little post with some pictures from New Year's Eve. 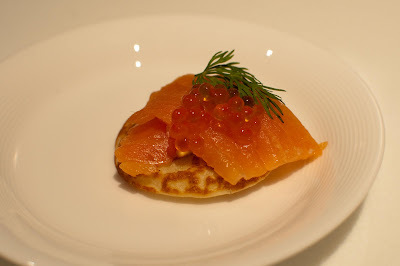 Blinis with trout caviar, smoked salmon, dill, creme fraiche. 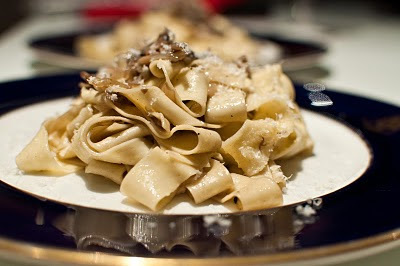 Fresh pasta with sliced summer truffles and maitake mushrooms. 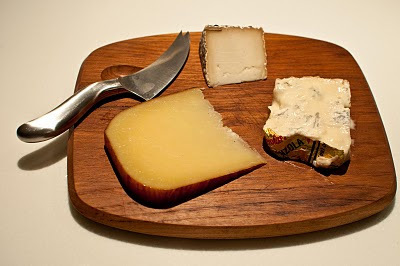 Cheese: Gorgonzola Dolce, Juilana (Indiana Goat's Milk Cheese), Dante (from Wisconsin Sheep Dairy Cooperative). 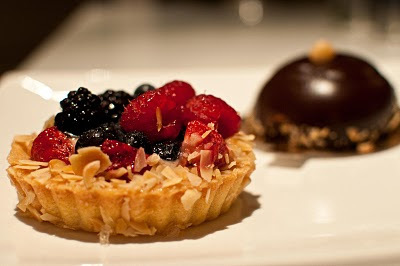 Mixed berry tart and chocolate mousse cake.